Here is a great video showing two chimpanzees who discover a game camera. I found this link on the Camera Trap Codger's site. There are no details on where this took place or exactly what the camera set up was. From the look of it, the camera was hidden in a hollow tree. As you will see, it wasn't hidden well enough. Take a look at the video below. I thought it was interesting that the two chimps were carrying sticks as they were going about their business in the jungle. The pair were carrying the sticks in their mouths as they knuckle walked along the trail. Upon discovering the camera, the chimps make an up close inspection by peeking into the hollow of the tree. 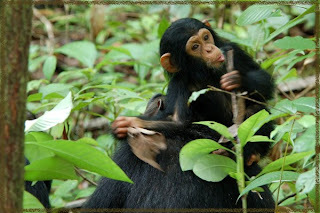 Before touching the camera with their hands the chimps "test the waters" by poking at the camera with their sticks. Can you imagine getting video of a sasquatch that is this clear and definitive? This is what the TBRC, and other organizations who have implemented camera trapping projects, are hoping to capture. Many feel that only a body will be enough to convince mainstream science of the existence of the sasquatch. I understand where they are coming from but disagree. Close-up clear video/photos should do the trick. It will take something on par with this video of the two chimpanzees to convince everyone but I think it can be done. "The man with a theory will always be at the mercy of the man with an experience." These words could not be more true. I fully understand that mainstream science will demand hard facts before recognizing the sasquatch as an existing species. I have no problem with that. I feel that hard evidence is there, by the way, but that is for another post. What I know for sure is that people who have seen these creatures and know they are real will continue the search. Some will tire and give up but many will keep their heads down and plug away until, finally, that ever-elusive proof is found. No amount of scoffing by skeptics will deter them from this search because they know what is out there. They don't have a theory. They have had a life changing experience. A Big Cat or a Big Dog in the Metroplex? I received an email from a reader whose brother claims to have spotted a black panther/cougar in the Plano/Richardson area back in January of this year. I corresponded with this gentleman a couple of times to get details. The statements below belong to the reader and his brother, the actual witness, but come from several different emails. Hi, my younger brother came over today with an interesting story. While driving home thru the Richardson/Plano Texas area he, his son, and a friend witnessed what looked like a panther crossing the street. He stated that a couple of other cars also witnessed it and one came to a stop. They lost sight of the cat when in crossed into someone's back yard. This was the Plano / Richardson area on 1/22/2010. Got to tell you it really freaked him out LoL. He is kind of superstitious and he said the cat just looked so unreal. One thing he did mention that caught my attention was that the end of the cats tail really had a curl to it. It happened at 11:40 am on Friday morning 01/22/10. It ran across the street and all the cars in the six lanes of traffic came to a complete stop trying not to hit it. It is hard to explain what it was because I don't think there is a zoo nearby. My first thought was a dog but then we saw it and it was about as tall as a Rottweiler but longer shaped like a cat. It was running with its tail, really long tail, curled between his legs I guess from fear of getting hit. Then I thought it was a mountain lion of some kind but it was dark like a panther. I felt like I was dreaming. It seemed so unreal like if someone was using a projector screen because it almost looked like some computerized shadow floating across the street. I say floating because it ran so weird. We tried to see where it went but there were a bunch of bushes behind a barred fence to where it ran behind those peoples house. If you need anymore info let me know and if you find it please let us know so my imagination will stop running crazy. My Sister and her kids live about 1 mile from there and she says that there have been reports of coyotes killing domestic animals around there and I have seen reports of a cat killing other anilmals around there. I am 100% sure that is was not a coyote and I have never seen a cat that big outside of the zoo! The spot of this sighting is near the intersection of E. Renner and Jupiter Rd. in Richardson, Texas. This area is very urban and would, on the surface, be a surprising spot to see a big cat. Having said that, it fits the pattern of other big cat sightings in the Dallas/Fort Worth area. Also, one would not have to go too far east to get to a much more rural area. Both Lake Ray Hubbard and Lake Lavon are lay only a few miles away. The landscape begins to get much more lonesome once you get to these reservoirs. A big cat sighting near these lakes, while unusual, would raise far fewer eyebrows. 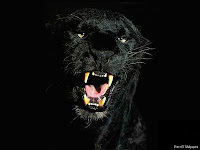 Likewise, this sighting is not too far from the Lewisville and Plano areas where other panthers have been reported. You can review some of the more recent sightings of big cats in the Metroplex area by opening the "Big Cats" label to the right. Having said that, I will now play devil's advocate. I think the possibility of a misidentification must always be considered. The witness mentions that he thought the animal was a dog at first. Granted, a very large dog. The witness also mentions that the animal had its tail tucked between its legs, in apparent fear, as it attempted to cross the busy six-lane road. This is very dog-like behavior. Add to the fact that this was a very dark animal that resembled a "Rottweiler" and a "computerized shadow" and maybe we have a very large dog trying to cross the road. Often first instincts are correct. If the witness thought "dog" initially then maybe he was right. I decided to find out if any dog breed matched up well with the description the witness gave for the animal he saw that morning. 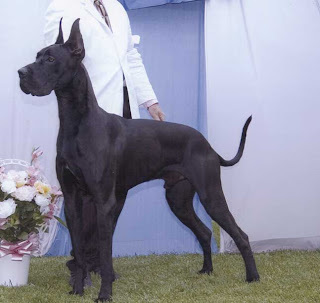 these Great Danes would be a match for most descriptions of black panthers. 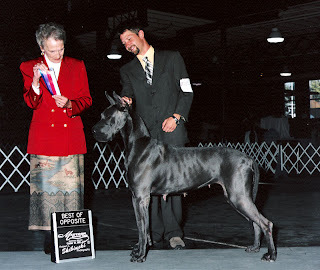 Great Danes bred for showing would also have had their ears clipped which makes them stand upright. This could give the dog more of a cat-like appearance. Also, unlike other large dog breeds like Rottweilers, Boxers, etc., Great Danes do not have their tails bobbed. So, the fact that the animal seen crossing the road had a long tail would not eliminate the Great Dane as a suspect. To suggest the Great Dane is responsible for all the black panther sightings in this, and other, states is ludicrous. In a metropolitan area, however, maybe it is a possibility that should be considered...or not. Just throwing it out there. The fact that witness saw this animal in broad daylight makes misidentification less likely in my view. However, he initially thought the animal was a dog so it is a possibility that must be considered. The fact that other cougars have been reported in the area would seem to be supportive, albeit anecdotal, evidence suggesting that this witness did see a cat. Unlike the other big cats reported in the area, this animal was black. The plot continues to thicken. Once again, I really want to hear about any sightings of cougars or panthers regardless of where they are spotted in the state. The best way to get in touch with me is via email. Please send your sighting reports to Texascryptidhunter@yahoo.com. Anyone still giving Daniel Rainsong the benefit of the doubt regarding his alleged sighting of an Ivory-billed Woodpecker in the Sabine River bottoms of southeast Texas has got to be jumping ship now. An article in today's Ames Tribune reports that Daniel Rainsong was arrested and charged with the theft of $10,000 from his dependent mother and with fraudulently using a blank personal check left with him by his father-in -law. Rainsong had obtained power of attorney over his mother and allegedly took only weeks to drain her bank account for his own personal expenses. The check from his father-in-law was meant to help cover his mother's medical and pharmacy bills. According to the article, Rainsong told his father-in-law the expenses would be less than $3,000. Rainsong faces two counts of first degree theft, a class C felony, and one count of dependent adult abuse, a class D felony. A preliminary hearing has been set in the case for Tuesday February 23 in Nevada. The entire article, written by Luke Jennett, can be accessed here. It appears the whole sorry Rainsong episode is coming to a close. Rainsong's obsession with claiming a reward for the discovery of a live Ivory-billed Woodpecker now, unfortunately, makes more sense than ever. Any shred of credibility his story might have had is as extinct as the woodpecker he sought is alleged to be. Now that some of the Ivory-billed mania has died down a bit, I thought I would add a few of my thoughts on this elusive bird, how it and other rare animals may have adapted to survive, and the similar difficulties faced by searchers of the IBW and other rare and/or undocumented animals. The biologists who think the Ivory-billed Woodpecker still exists in the most remote forests and swamps of the deep south speculate that they are extremely wary. It is true that not a whole lot is known about IBW behavior but I think it is logical to assume it would behave much as other woodpeckers would in regards to interaction with humans. Many woodpeckers are quite shy around people and difficult to photograph. They will play a game of hide and seek with would be photographers and bird watchers, continually shifting positions to keep the trunk of a tree between themselves and their human pursuers. If the IBW was already a shy and reclusive species, like other woodpeckers, when their numbers were high then they would likely be incredibly wary now. As their habitat and numbers dwindled only the members of the species who were the most wary would have remained. It is likely, as a result of natural selection, that these individuals would have produced a generation of ultra-shy and reclusive birds. Even biologists involved in the well funded Cornell search for the Ivory-billed Woodpecker in Arkansas estimated there was an 80% chance of missing the bird altogether in their main research area. The Ivory-billed Woodpecker was given many nicknames over the years one of which was the "Ghost Bird." It seems this name was very well deserved. "On the other hand, failure to find the birds in a given area is no proof that they are not there, for they are not noisy except when disturbed; their voice does not carry nearly as far as that of the Pileated Woodpecker and in the big trees which they normally frequent they are easily overlooked. We camped for five days within three hundred feet of one nest and, except when the birds were about to change places on the nest or were disturbed, seldom heard them. We had great difficulty in following them through the woods to learn their feeding habits even after becoming very familiar with their notes. The senior author at one time stood under a giant oak and caught in his hand chips of bark and wood than an Ivory-bill was scaling from a dead branch high in the tree without either one being able to see the other. We had hunted for three days for this particular pair of birds without ever hearing them, even though we were frequently within three hundred yards of the nest, which we finally found because we happened to be within hearing distance when the birds changed places on the nest." This process, by which, an incredibly wary remnant population of Ivory-billed Woodpeckers may have been produced has been observed in other species, including large mammals. Mainstream scientists have long thought the grizzly bear extirpated from the South San Juan Wilderness area of Colorado. Persistently, and irritatingly to some biologists, sightings of grizzlies in the area continue to trickle in on a fairly regular basis. It has been theorized that this remnant population of grizzlies has become incredibly cautious and wary. Many who believe this great bear to still be present in the region have gone on to speculate they have become almost totally nocturnal. This behavior would be an adaptation that would make contact with humans unlikely and ensure only the most wary of all grizzlies would reproduce. 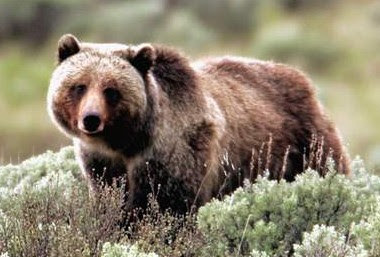 These bears have been dubbed the "Ghost Grizzlies" of the San Juans. Several good books have been written on this topic. Ghost Grizzlies: Does the great bear still haunt Colorado? by David Petersen and The Lost Grizzlies: A Search for Survivors in the Wilderness of Colorado by Rick Bass foremost among them. Could the reclusive behaviors of the IBW and the grizzlies of Colorado be applied to another legendary cryptid? Based on what we know about the behaviors of stressed and endangered animal populations, it is not surprising the sasquatch has not yet been documented. Many will claim what is known about IBW and grizzlies cannot be applied to a species that may not even exist. I will concede that to entertain my theory one will have to entertain the possibility that the sasquatch does exist. Once this is accepted as a possibility, then it seems logical, to me at least, to think that the sasquatch may very well be behaving in a similar fashion to other threatened species. They would be very wary and cautious. They would likely make every effort not to be seen by humans. Much like the IBW, the areas the sasquatch is thought to inhabit in the south are very inhospitable to humans. Areas where sightings are reported the most often in Texas are low in elevation, marshy, swampy, and heavily wooded. The undergrowth is often so thick and thorny it makes traversing the terrain all but impossible. These areas are an evaders paradise. From personal experience I can say that it would be very easy, even for a large animal, to remain hidden from human eyes simply by ducking behind a tree and being still and quiet. 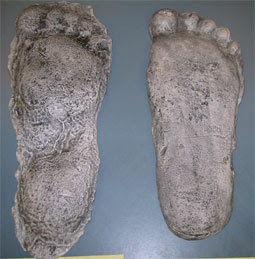 The sasquatch, like the "ghost grizzlies" of the San Juans, may prefer to move about mainly at night. This is a startling departure from the behavior of other great apes, however, it may be an adaptation necessary to ensure the survival of the species. It is likely that the sasquatch started out as a very wary species. Over time diminishing habitat and human encroachment, along with natural selection, have likely produced a super stealthy and reclusive population of animals. Many who read this piece will see the quote from Allen & Kellogg's article above which says in part, "On the other hand, failure to find the birds in a given area is no proof that they are not there," and be reminded of the old sasquatch researcher's mantra that says, "Absence of evidence is not evidence of absence." I think it is an apt comparison. Most people tend to think of animals as sort of wandering about the forest totally oblivious to whether or not people are present. This is simply not the case. It is accepted that there are animal species that intentionally hide from and avoid humans. If the animal in question is very rare to begin with, is very quiet, and intentionally hides from humans it is going to be extremely difficult to get a glimpse of. When you add the inhospitable habitats in which the species discussed here live to the equation the enormity of the task of discovery begins to crystallize. These factors will continue to be a stumbling block to those who seek to document a new species, like the sasquatch, or a remnant population of known animals like the Ivory-billed Woodpecker or the grizzly bear of Colorado. My hat is off to those who continue to try. *My thanks to my friend Alton Higgins for the heads up on the article from The Auk. Alton continues to be an invaluable source of information for this site. 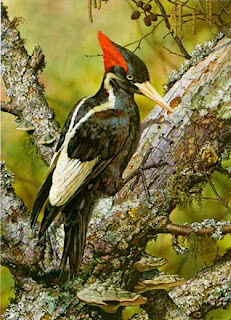 Nature has published an article on Ivory-billed woodpeckers on their website. The article can be accessed here. A couple of different IBW topics are touched upon in the piece. 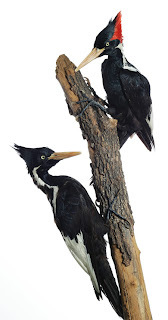 One topic the article touches on is the 2005 claim by a team of researchers that they successfully filmed an Ivory-billed woodpecker in the swamps of Arkansas and the frustration biologists are now experiencing trying to locate the bird again as their funding dries up. It seems the hopes of finding and saving the species are fading. Many scientists thought there was a good chance that there was a remnant population of this legendary bird surviving in the swampy bottomlands of the deep South not so long ago. That seems to be changing. "We don't believe a recoverable population of Ivory-billed woodpeckers exists," said Ron Rohrbaugh, a conservation biologist at Cornell University in Ithaca, New York, who headed the original Arkansas search team. The Nature article also mentions the recent claims of Daniel Rainsong. Rainsong, of course, claimed recently to have photographed a living Ivory-billed woodpecker near the Sabine River in southeast Texas. According to the article, Rainsong has filed a formal complaint alleging ethical and financial misconduct by several prominent bird experts. Rainsong claims that these biologists would not come with him to the Sabine River in order to confirm his sighting thus denying him a chance to collect a $50,000 reward. I have a friend close to this whole mess who says Rainsong's claims are totally false. It is true that the photos were judged to be inconclusive, However, this contact claims that Rainsong was taken very seriously and arrangements were being made with him to visit the sighting location before legal action was taken. In any case, Ron Rohrbaugh says the Cornell University team will release an analysis of Rainsong's photo in about a week. I've recently come across a couple of news items about the incredible memory capacity of chimpanzees. It seems chimps have both an amazing short-term and long-term memory. Read on for details. The first item I ran across was an article by Matt Walker, editor of the Earth News section of the BBC News website. The article discusses the ability of chimpanzees to remember the exact location of all their favorite fruit trees. It seems their spatial memory is so precise that they can find a single tree among more than 12,000 others within a patch of forest. The study was conducted by Emmanuell Normand and Christopher Boesch of the Max Planck Institute for Evolutionary Anthropology in Leipzig, Germany. Also participating was Simone Ban of the University of Cocody in Abidjan, Ivory Coast. "We were amazed by the apparent easiness by which chimpanzees discover highly productive fruit trees. Or how, after being separated from other group members for hours or days, they could join each other silently at a large fruit tree, like if they would have had an appointment at this place," said Normand. The chimps not only remember the location of individual trees but recall which of these fruit bearing trees is most productive and when it is in season. They will often travel much farther to reach the more prolific trees. The details can be read in the article here but the conclusion reached is startling. "We think it is fair to assume that chimpanzees can remember the exact location of probably thousands of trees," said Normand. Normand added, "In one respect, it is not surprising that chimpanzees have developed an outstanding ability to navigate their home range." Normand is alluding to the idea of what is commonly dubbed "ecological hypothesis" which theorizes that the need to remember and locate food sources could have been the driving factor behind the evolution of the primate brain. Specifically, the hypothesis says that a preference for fruit eating would stimulate brain development faster than would be seen in animals that are leaf eaters. Leaves are easier to locate while good fruit is harder to find and presents unique problem solving opportunities (breaking open nuts, etc.). The second item regarding chimpanzee memory that I took a look at this week was a video I viewed over at Cliff Barackman's North American Bigfoot blog in which a captive chimp's short-term memory was tested. The study was conducted by the Kyoto Primate Research Institute in Japan. The test subject was a 7 year-old chimp. The task for the chimp was to view a screen with the numbers 1-9 in random locations briefly and try to remember the exact location of the numbers as quickly as possible. The task was made more difficult for the chimp as once the chimp touched the screen to place the number 1 in its proper location the other numbers were blocked out. If that is as clear as mud just take a look at the video below. The chimp places the numbers in correct sequence every time after viewing their locations originally for as little as 0.65 seconds. The results indicate that at least this particular chimpanzee has a short-term memory that is far superior to that of nearly all humans. When the results of the long-term memory study on wild African chimps are considered in tandem with the results of this short-term memory experiment a rather impressive overall picture of the memory capabilities of the chimpanzee begins to take shape. What can the results of these two studies teach us? Can we take any of this data and apply it to the alleged habits of North America's great ape, the sasquatch? Possibly. While it is almost universally accepted that chimps are incredibly intelligent they are not thought to be the smartest of the great apes. Most primatologists feel the rightful owner of that title would be the orangutan. 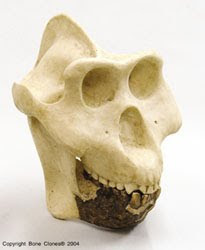 If the size of the skull, and its brain cavity capacity, have any link to intelligence, and most scientists believe it does, then the sasquatch would likely be the most intelligent of the great apes by a wide margin due to its massive size. If chimps can remember the location of up to 12,000 individual fruit trees spread out over hundreds of square miles the sasquatch may be the equivalent of a walking GPS unit. If true, is it any wonder it is so difficult to catch a glimpse of these elusive animals? They would remember the location of every cave, gulley, canyon, thicket, creek, draw, and water source in their territory. In short, they would know where all the best hiding places are located, and the quickest way to access them, making them nearly impossible to detect. To underestimate this ability while attempting to track down a sasquatch would doom the effort to failure. There is something else that disturbs me about the remarkable memory of these chimpanzees. If sasquatches have the same impressive capacity for memory that chimpanzees do and if, and this one is a big if, they associate game cameras with humans then it might be a very long wait before we get convincing photographic evidence from a camera trap. Don't get me wrong, as has been stated unequivocally on this blog many times, I am a huge advocate of camera trapping. This method has proven itself to be a valid way of documenting rare and elusive species. However, if the sasquatch can remember the location of thousands of individual trees/locations then it would be relative child's play for them to avoid individual trees/locations that house cameras. This in no way implies a sasquatch understands what a camera does. However, an understanding of such a device would not be necessary to make the association between it and humans. Such a location would likely be avoided. So, what is the solution? Should we all pull all our cameras out of the woods and just give up? Absolutely not. I still think camera traps may very well be the way this species is documented. After all, for a camera location to be identified and later avoided it would first have to be found by a sasquatch. This discovery could occur at the same moment the "discovery shot" is being snapped. If the sasquatch avoided the location from that point on it would not matter. What may be warranted, however, is a change in philosophy. Maybe instead of leaving cameras in the same locations for months or years at a time they should be moved periodically. This creates obvious logistical problems but if no shots are obtained from a specific spot after a certain length of time it might be wise to think the location has been noted by the target species and is now being avoided. Maybe moving the cameras long distances would not be necessary. I know the TBRC takes great care in choosing camera locations. Let's say a promising game trail has been chosen. Maybe the camera need only be moved a few hundred feet or yards to a new tree to be effective. It would take some time for the move, subtle as it would be, to be discovered by the target species. Maybe we could catch one these incredible animals unawares just once by doing so. "In nature, improbabilities are the one stock and trade." This quote fits my philosophy on the existence of the sasquatch nicely. Is it unlikely? Is it improbable? Maybe. Impossible? Certainly not. Ms. Dillard sums it up rather elegantly, if you ask me. I figure now is as good a time as any to start posting some of the "sasquatch classics", and my thoughts on them, as promised last year. These are the stories that have become legendary not only to bigfoot enthusiasts and researchers but to many in the general public as well. These are the accounts of some of the most incredible encounters of all time with these mysterious creatures. Some of these stories are very well known. For example, the incidents at Ape Canyon, Ruby Creek, and the abduction claims of Albert Ostman have been told and retold many times. Others are more contemporary and, perhaps, less well known. I hope to retell the details of these encounters as accurately as possible and then offer my thoughts on them. So, without further adieu, here we go. The first story I would like to discuss is the incident that allegedly occurred in the vicinity of Battle Mountain, Nevada in August of 1999 and might be deemed a "modern classic". On, or about, August 6 several wildfires sprang up and engulfed the wilderness around Battle Mountain. Several state and federal agencies were present to help in battling these fires. 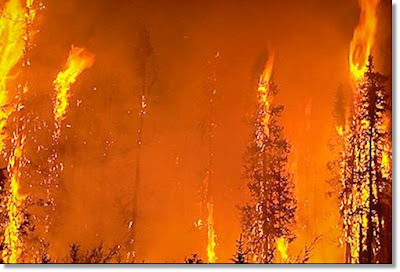 These agencies included, but were not necessarily limited to, the U.S. Department of Fish and Wildlife, the Department of the Interior, the Bureau of Land Management, and, of course, numerous fire fighting units from Nevada and its surrounding states. 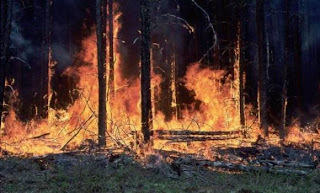 According to a witness who claimed to have been on the ground during the attempts to contain the fire, a sasquatch was injured during the blaze and was captured by fire fighters. The witness submitted a report to the BFRO on August 7, 1999. His account was not deemed credible by BFRO curators and was never published. Thom Powell, author of The Locals, however, felt there might be something to this report and pressed for more details. You can read his entire account of the incident here but I will try to hit the high points below. The basic story is that a large hair-covered creature came stumbling/crawling out of the burning forest as the witness and other emergency personnel watched. The creature moved on all fours. "Not like a bear. Like an ape," the witness said. The animal was clearly badly injured and was quickly surrounded by fire fighters. The creature, according to the witness, "seemed to know that he was captured and he just gave up. The animal just sat down on its buttocks and exhibited no will to resist." The "patient" was laid out on the ground and medical personnel were summoned. According to the witness, the creature had suffered serious burns on its hands, feet, legs, and trunk. Much of its hair had been singed off as well. The story goes on to say both a veterinarian and an M.D. arrived and began working on the animal. Interestingly, the vet deferred to the M.D. as the "animal" appeared so human-like. The creature was triaged, tranquilized, and hauled off on a much too small stretcher. The witness said the animal was transported away to an unknown location in an unmarked van. The personnel in charge feared an ambulance would attract unwanted attention as people in the surrounding areas, as well as the media, would assume a fire fighter had been injured and would want details. Once the creature had been taken away, the approximately 25-30 eyewitnesses were given strict orders not to discuss what they had seen. of the hands were bare with five digits including a human-like opposable thumb. degree burns over roughly 45% of its body. served seeping from the animal's wounds as was blood. - The creature exuded a "natural" odor similar to a strong equine smell. large but human-like. The ears were also human-like and tight to the head. The witness added more details, which can be read at the link provided above. This tale has always intrigued me. It is exactly the sort of scenario that could lead to the discovery and documentation of the sasquatch. The idea of finding an injured sasquatch as the result of a raging forest fire is not so far fetched if you are able to bring yourself to accept the possibility of the species' existence in the first place. The amount of detail given by the witness is startling. Much of what was described matches up well with what other witnesses have reported. However, the story also gets pretty deep into the possibility of government cover-ups and conspiracies that seem to be so prevalent in the bigfoot mythos. The witness claims he, and the other witnesses present that day, were threatened with the loss of their jobs and retirement if they spoke publicly about the incident. The creature was whisked away in an unmarked van to an unknown location and was never seen again. This is a little too convenient and "Roswell-like" in some peoples minds. So, what to make of all this? To me this story has a bit of everything. Maybe a bit too much for my liking. While I can see the scenario unfolding as described it is the aftermath that troubles me. Secrets are incredibly hard to keep. The more people who know the secret the more difficult it becomes to keep. Even if the numerous witnesses really were threatened with being fired it is almost impossible for me to swallow that none of them have talked since 1999. It has been more than a decade now since these fires ravaged the area around Battle Mountain, Nevada. The witness claims 25-30 people saw this creature and everything that transpired with it. Yet, this one guy is the only one who has spoken up. Surely, some of these people have changed jobs in the years since the incident on their own. If so, their reason for remaining quiet would be gone. What would be stopping them from coming forward now? Even if they remained hesitant to go public with their knowledge I would think it almost a certainty that the story would have been circulated after a few drinks with friends, around a campfire, or even while engaged in "pillow talk." Somehow, the account would have gotten out. The fact that the story of the bigfoot of Battle Mountain is not more well known seems to indicate one of two things. The other witnesses have remained silent all these years or the incident did not occur at all. As much as I would like to believe otherwise, the latter is the most likely. Without corroborating evidence or testimony the story doesn't seem to hold up. This would be the sort of case that might be kept in a file marked "unlikely" but not thrown out all together. Without some sort of corroboration it is just another story proving nothing. If another witness were to ever come forward, my opinion on this could certainly change. As it stands now, the tale of the "Bigfoot of Battle Mountain" will, in my mind at least, remain in the same gray area as many other sasquatch tales. Fascinating, but inconclusive. Are Coyotes Becoming More Dangerous? There is an interesting article by Chester Moore Jr. on the Port Arthur News website that asks a simple question. Are coyotes dangerous? Moore does a nice job of summarizing several coyote incidents, including the fatal attack on Canadian pop singer Taylor Mitchell. You can access the article here. Moore points out that most wildlife agencies will tell you that coyotes are not dangerous to people and that attacks on humans are incredibly rare. Moore, himself, believes otherwise. He writes,"In states like California, for example, there were dozens of instances of coyotes biting people, attacking their pets while owners walked them on a leash, and other types of aggression that were soon followed by vicious attacks on people." Moore recounts a conversation he had with a wildlife official who explained how a coyote bit a man in an urban area of Texas recently but did not consider the incident an attack because he felt the predator was drawn in by the smell of grilling meat. Moore points out, correctly in my opinion, that "The guy who had a hunk taken out of him probably has an entirely different view." Are coyotes dangerous to humans? A few months ago I would have said probably not. Incidents seem to be piling up, however, that are making me think otherwise. I had a strange coyote encounter myself not too long ago that was a bit disturbing as it occurred on the heels of the attack on Taylor Mitchell. 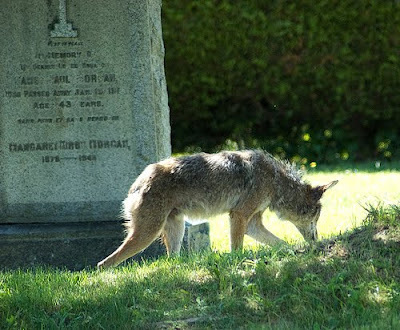 The coyote is an opportunistic predator that has few, if any, natural enemies left in the wild. They have proven to be resourceful and more than able to live quite comfortably in urban settings. They seem to be losing some of their fear of humans. 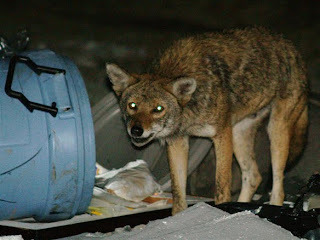 If you have pets or small children and live in an area where coyotes are known to roam caution is definitely warranted. The combination of urban sprawl and exploding coyote populations make encounters unavoidable. Unfortunately, some of those encounters are bound to end badly. So,are coyotes dangerous to humans? The answer, it seems, is yes. I have received some interesting information from a source close to the Daniel Rainsong/Ivory-Billed Woodpecker situation. I'm afraid the information he has provided is far from surprising. Basically, as has been suggested at various other internet sites, Mr. Rainsong's recountings of events surrounding his alleged sighting have not proven to be consistent. Also, in the opinion of this source, the photos provided by Mr. Rainsong do not clearly depict an Ivory-billed woodpecker. There is more I would like to share but I don't feel it would be prudent, for various reasons, to do so at this time. Rest assured, however, that I have passed along the most pertinent information of which I am aware regarding this claim. Hopefully, certain circumstances will change which will allow me to share some additional particulars regarding this whole episode. So, this one is smelling worse by the day. I hope I'm wrong. I hope Mr. Rainsong can produce more convincing evidence. I won't be holding my breath, however.